It is always enjoyable to return to places that you have been to before to go birding and find out what has changed over the seasons. Windjana Gorge is closed for a good part of the year due to flooding and the access roads becoming inaccessible, but for the past couple of months it has been open. 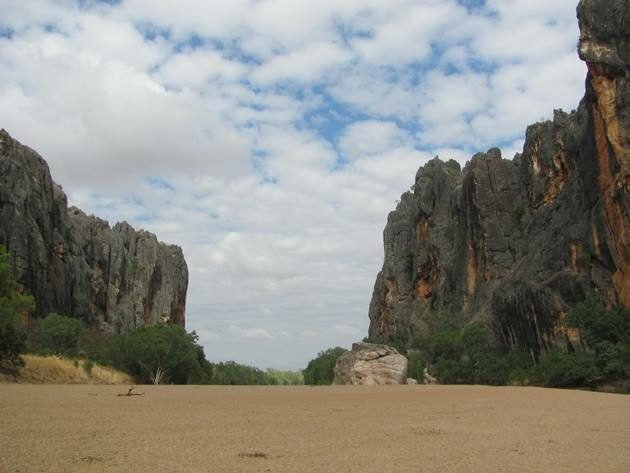 We have visited it in other years during the dry season and on each occasion it has been very hot within the gorge. We have made two trips since it opened this year and one trip was at the end of May and the following at the end of August. The main difference at the end of August was the reduction of water in the gorge. It was also overcast making for a cooler walk and as different plants flower there are different birds to be encountered. Even on the approach to the gorge we encountered a Black-breasted Buzzard, Black Kites, Whistling Kites and Brown Falcons. The car-park offered Peaceful Doves, Little Corellas, Magpie-larks, Willie Wagtails and Double-barred Finch. One of the first places you should stop before you enter the gorge is at the notice board on your left. There is a list of the birds, mammals and other creatures that you may encounter, but to your right there is an active Great Bowerbirds‘ bower. Several Great Bowerbirds will contribute to the bower in the hope of attracting a mate. We observed a male Great Bowerbird rearranging some of the items while we stood on the path. 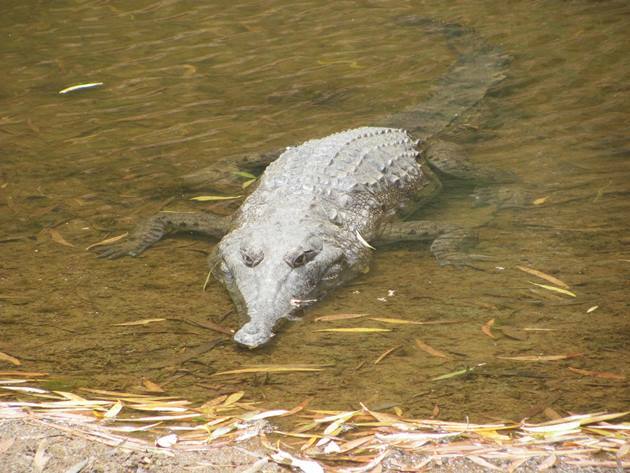 The freshwater crocodiles are the main attraction for many of the visitors and they are easily encountered close to the car-park. If you are prepared to follow the marked trail through the gorge and spend a few hours there you will encounter a good variety of birds on any visit. You will mostly be alone in the gorge and you do need to carry ample water, because it soon heats up during the day. We soon encountered Brown Honeyeaters, Mistletoebirds, Rainbow Bee-eaters, Paperbark Flycatchers, White-gaped Honeyeaters and Striated Pardalotes. On the far bank there was a Great Egret, White-necked Heron and Australian White Ibis together. 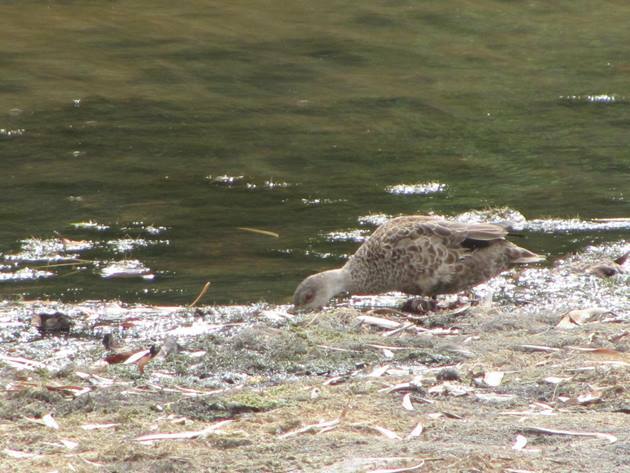 The only duck species that we encountered in over four hours in the gorge was a Grey Teal and it was a lone bird feeding close to a Straw-necked Ibis. There was also a lone Royal Spoonbill, White-faced Heron, Australasian Darter and Little Black Cormorant. Black-fronted Dotterels were active in several areas throughout the gorge and they were not in the least concerned about the presence of all of the freshwater crocodiles. 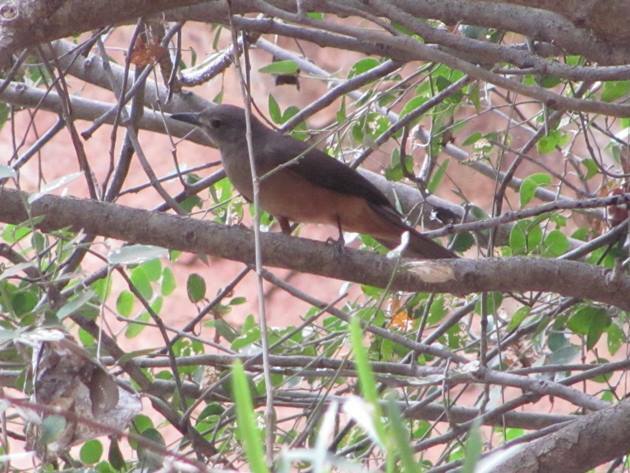 As soon as we observed one or two bird species in the trees we stopped and listened and watched. There were several really good areas where we encountered Northern Fantails, Rufous-throated Honeyeaters, Green-backed Gerygone, White-throated Gerygone, Little Friarbird, Black-faced Woodswallows, Grey Fantails, Grey Shrike-thrush, Leaden Flycatchers, Yellow-tinted Honeyeaters, Olive-backed Orioles, Varied Lorikeets, Weebills, White-throated Honeyeaters and of course the Sandstone Shrike-thrush. 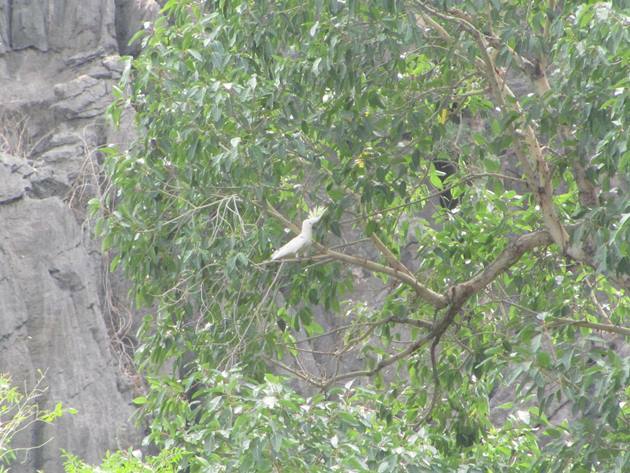 The noisiest bird in the area was the Sulphur-crested Cockatoo, but there was also a new colony of fruit bats that had not been there in May. The flowering trees were very productive and we were not necessarily expecting to find Bar-breasted Honeyeaters or Silver-crowned Honeyeaters, but they were there feeding on the nectar. Our 2018 year list was getting topped up nicely and then we discovered a beautiful Azure Kingfisher sitting in the shade. 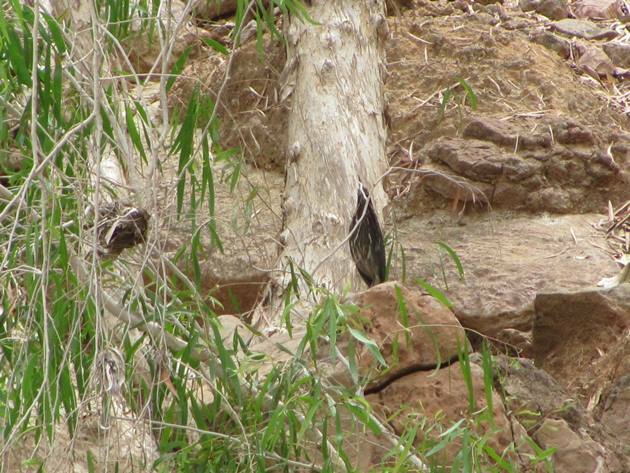 Although we had encountered a Black Bittern already earlier in the year we found two Black Bitterns in Windjana Gorge. One of the Black Bitterns chose to not move at all as I carefully approached and stretched itself upwards in the hope it was camouflaged. Bar-shouldered Doves, Crested Pigeons, Brown Goshawk, Nankeen Kestrel were also seen in the Windjana Gorge area and we have often observed Brolga coming in for a drink there. 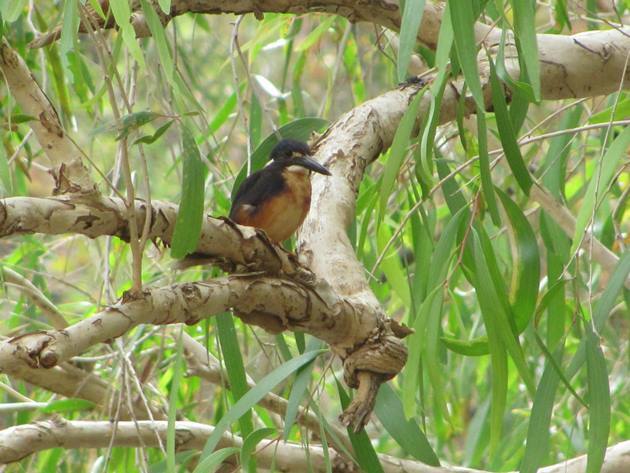 Windjana Gorge is definitely a worthwhile place to go birding when it is accessible. However, you do need to allow several hours to really take in the natural landscape and bird-life. What an incredible experience seeing all of those birds and crocodiles in such a spectacular habitat! 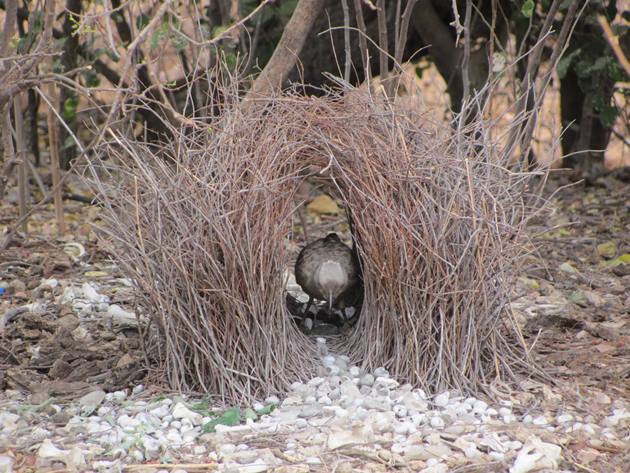 Superb photo of the Great Bowerbird and its bower. What a great area! One of many you are surrounded by! 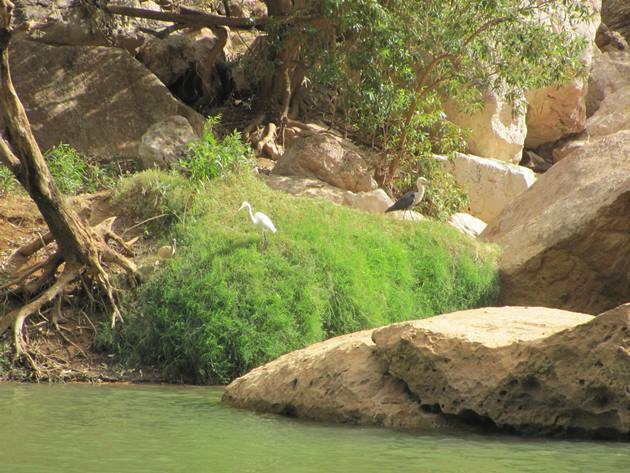 Yes, it is a great place to visit for birds, crocodiles and the scenery!